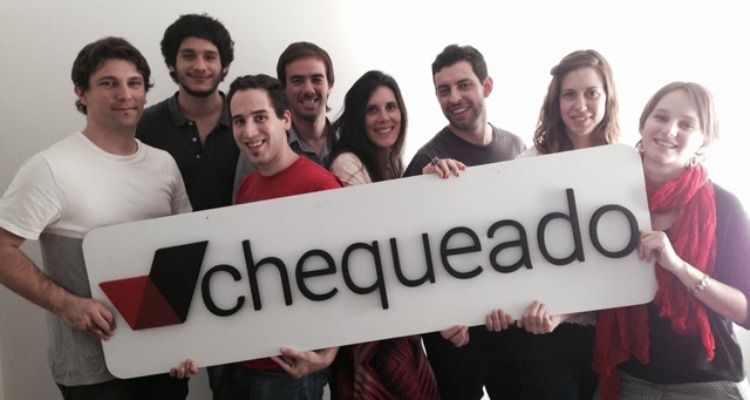 The team of Chequeado, a fact-checking non-profit news organization in Argentina. In recent years, a boom of global political fact-checking organizations has blossomed. The latest: Chequeado, a five-year-old fact-checking operation at the Buenos Aires-based open data outfit Fundación La Voz Pública. 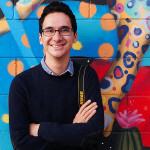 Chequeado is among the many global fact-checking operations taking shape through crowdfunding. Within the last year the trend has been forming in Italy, England, Canada and the United States. England: Full Fact raised more than $50,000 to fact-check the UK General Election. United States: PolitiFact raises $16,000 to fact-check the State of the Union address and kickoff 2016 election coverage. Chequeado (Spanish for “checked”) fact checks politicians, business people, economists, public figures and even media outlets both traditional and new that hold sway in public opinion in the country. It’s among the few new media organizations in Latin America who are pioneering the effort in using crowfunding for their operations. They already have used crowdfunding very effectively in their last campaign. They use social media to generate the financial backing they need from large donors by reaching individuals that look to their work to fund them. Chequeado Executive Director, Laura Zommer, says its organization represents the true nature of journalism’s basic principals of fact-checking, where online tools can be used to nullify misinformation around the media. “The leadership isn’t going to stop using facts strategically – everyone is going to use facts to tell the story that suits themselves most. That’s not going to change,” said Zommer to the Knight Center for Journalism in the Americas. Zommer feels that now the community has a chance to decipher information being thrown at them and be able to tell the difference and not be fooled by “intellectual trickery,” when leaders say whatever they want to the public. With the upcoming 2015 presidential elections in Argentina scheduled for October 25, Chequeado and other local media organizations face the challenge to keep candidates and its respective parties in check. Recently, the Association of Argentine Journalistic Entities (ADEPA, its Spanish acronym) called for protected press freedoms of political candidates, pointing to recent attacks by organized crime on journalists. The press points to current President Cristina Fernandez de Kirchner’s administration high profile case against the multimedia conglomerate Grupo Clarin; a contentious battle over the Audiovisual Communication Service Law that aims to break the media’s concentration of power in the country, according to supporters of the group. Also the general obstacles that journalists face in accessing public information, government pressures on advertising and harassment of reporters has led many to believe in the press like el Chequeado, that financial independence is critical in order to keep democracy in the country and function separately from the influence of politicians own agendas. On their recent crowdfunding efforts to fact-check the 2015 presidential elections, Chequeado states on their campaign site that to ensure their independence and sustainability (with a combined staff and volunteers of 50 so far), they resort to a different financial models like crowdfunding to help them become even more diversified and pluralistic in their intents, which they have tried by using trending topics and popular charity causes on Twitter like the #IceBucketChallenge , under the hashtag #NoMandenFruta (meaning “don’t send fruit” having a double meaning, an idiom for “no bull.”) to keep the public engaged and aware of their role in holding officials accountable to them, in their past campaigns. Chequeado is currently not just financed through crowdfunding, but other means like individual donations on their website, business foundations, public workshops, international cooperatives all mainly derived by their non-profit foundation La Voz Pública. Chequeado has already this year fact-checked the opening presidential speech to the Buenos Aires’ Congress; it follows other fact-checking sites around the world, like U.S. based PolitiFact, whom back in January fact checked the State of the Union live, among other noteworthy fact-checking evens like a debate about housing by mayoral candidates for the city of Buenos Aires. With their $120,000 crowdfunding goal surpassed, they will mimic and develop a similar fact-checking methods already been used by eight other Latin America media organizations in Uruguay, Peru, Mexico, El Salvador, Brazil and Colombia that have worked for checking presidential candidates remarks. According to the Duke University Reporter’s Lab, which operates under PolitiFact founder Bill Adair’s direction, this is a phenomenon not just in Latin America. Adair found 44 organizations that are currently active around the world fact checking, some as unlikely as the Ukraine. As for Argentina itself, Laura Zommer has seen crowdfunding having an effect on the country but mostly in the realm of mostly ‘green’ issues, like whales and forests. “Those are more tame than our issues [that Chequeado looks at]. There is no culture [in Argentina] of publicly supported organizations that work on accountability. We are changing that,” she told the Knight Center for Journalism in the Americas.